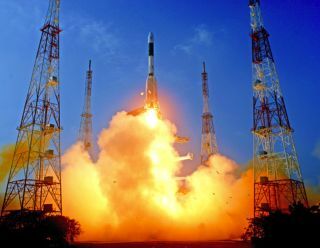 Although it carried a costly communications satellite, India's space agency officially considered the launch a test flight for the GSLV and its indigenous hydrogen-fueled third stage. The 161-foot-tall rocket blasted off at 1048 GMT (5:48 a.m. EST) on Jan. 5, darting through a clear afternoon sky over the Satish Dhawan Space Center on India's east coast, where it was 4:18 p.m. local time. A remote camera near the launch pad captured this view of the Indian Geosynchronous Satellite Launch Vehicle's liftoff on Jan. 5, 2014. The GSLV's second stage assumed control of the flight for more than two minutes, then yielded to the rocket's Indian-built cryogenic engine, which failed at the moment of ignition during a previous demonstration launch in April 2010. Only three of seven GSLV missions before Jan. 5 were considered successful by the Indian Space Research Organization, drawing unfavorable comparisons to India's smaller Polar Satellite Launch Vehicle, which has amassed 24 straight successful flights. No such anomalies occurred on the Jan. 5 launch, and the third stage engine fired for 12 minutes before deploying India's GSAT 14 communications satellite. "Some used to call the GSLV the naughty boy of ISRO," said K. Sivan, GSLV project director at ISRO. "The naughty boy has become obedient." A raucous wave of applause erupted inside the GSLV control center at the launch base on Sriharikota Island about 50 miles north Chennai on the Bay of Bengal. All of the rocket's systems seemed to function as designed, and ISRO heralded the mission as a success. "The Indian cryogenic engine and stage performed as predicted, as expected, for this mission and injected precisely the GSAT 14 communications satellite into the intended orbit," said K. Radhakrishnan, chairman of ISRO. "This is a major achievement for the GSLV program, and I would say this is an important day for science and technology in the country, and for space technologyin the country." The flight's primary purpose was to demonstrate the viability of the Indian-built upper stage with the country's first cryogenic engine. Cryogenic propulsion technology is a stepping stone for India's ambitions to develop larger launchers to haul heftier payloads to Earth orbit and toward interplanetary destinations. India started development of the GSLV in the early 1990s planning to use Russian-built cryogenic engines and technical know-how, but the agreement was quashed in 1992 after U.S. authorities imposed sanctions on Glavkosmos, the Russian company providing technology to India. The United States feared the transfer of missile technology from the fractured Soviet Union to developing states. India responded by purchasing seven readymade cryogenic engines from Russia and starting the design of an indigenous upper stage from scratch. The Indian-built upper stage's first test flight in April 2010 failed as the engine ignited, dooming the launch. Another GSLV mission in December 2010, this time using a Russian cryogenic engine, veered out of control less than a minute after liftoff and disintegrated when cables between the launcher's computer and strap-on boosters inadvertently disconnected in flight. Since 2010, Indian engineers made a number of improvements to the GSLV, including a redesign of the third stage engine's fuel turbopump to account for the expansion and contraction of bearings and casings as super-cold liquid propellant flows through the engine. Officials also modified the third stage's ignition sequence to ensure the "smooth, successful and sustained ignition" for the main engine, steering engine and gas generator system. India also made improvements to the third stage engine's protective shroud and a wire tunnel in the third stage. Engineers revised their understanding of the aerodynamic characteristics of the GSLV and added an on-board camera system to better monitor the rocket's performance in flight. Before approving the improved GSLV for flight, India completed two acceptance tests of the GSLV's third stage fuel turbopump to ensure it will not succumb to the same problem that plagued the April 2010 launch. Engineers also put the third stage engine into a vacuum chamber to simulate ignition at high altitude. "It was a big challenge to understand what really went wrong, and we had the benefit of the knowledge and the counsel of all of the whole of the ISRO team as well as our seniors, elders and veterans. Everybody put their heads together," said S. Ramakrishnan, director of India's Vikram Sarabhai Space Center, which oversees rocket developments. "This definitely gives us confidence that any technology we will be able to master with the kind of effort, the kind of dedication and with the kind of teamwork and commitment that we have." The reliability upgrades worked for the Jan. 5 launch. The Geosynchronous Satellite Launch Vehicle leaves a trail of exhaust in the afternoon sky over Sriharikota Island in India. Radhakrishnan lauded the GSLV team for an "excruciating effort over the last three-and-a-half years after we had the first test flight of this cryogenic engine and stage, and all the efforts by team ISRO over the last few years in understanding the GSLV, to make it a reliable vehicle, to understand the cryogenic engine and technology, to master and bring it to this level." The Jan. 5 flight, known as GSLV-D5, was delayed more than four months after Indian officials aborted a countdown Aug. 19 when the second stage sprung a fuel leak, causing toxic hydrazine to rain down on the rocket. Engineers rolled the GSLV back to the vehicle assembly building, cleaned the launcher and replaced the first and second stages. ISRO attributed the leak to cracks inside the second stage fuel tank and quickly developed a new second stage with tanks made of a different aluminum alloy less prone to corrosion. The payload for the Jan. 5 mission was a 4,369-pound Indian communications satellite. GSAT 14 will extend India's Ku-band and C-band communications capacity with 12 transponders, along with a pair of Ka-band beacons for frequency attenuation studies. After three orbit-raising maneuvers with its on-board engine and deployment of its solar panels and two antennas, the satellite will be positioned in geostationary orbit at 74 degrees east longitude for a 12-year mission. GSAT 14 will be positioned near other Indian satellites, such as INSAT 3C, INSAT 4CR and Kalpana 1, according to ISRO. The spacecraft also carries several technological experiments, including a fiber optic gyroscope, an active pixel sun sensor and new types of thermal coatings.